By late summer both of our plots have started to run out of puff, so I am always keen to seek out gardens which manage to keep up a good head of steam into autumn. 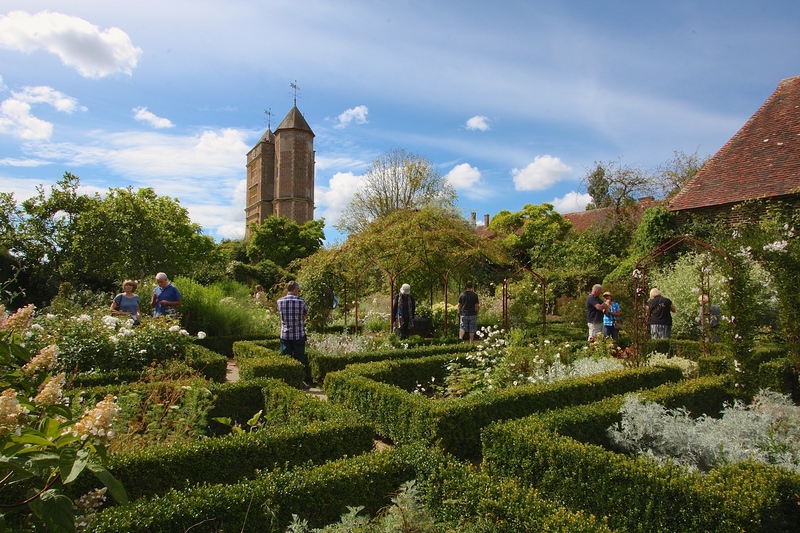 Sissinghurst is open almost every day of the year and has to cope with hoards of garden-loving pilgrims expecting picture-book perfection. This makes it the ideal place to go in search of ideas. The gardening team keep the place looking tip-top with meticulous maintenance and by continually filling gaps with seasonal plantings. On my last visit, at the end of August, the scene was stolen by flowers at two ends of the colour spectrum: the cool whites and the fiery oranges. The intensity of light in late summer brings out the best in assertive shades and Sissinghurst’s White Garden positively sparkled. An early clip in June meant that the complex arrangement of box hedges had once again assumed a soft, fuzzy outline, gently penning-in the exuberant perennials and roses inside. 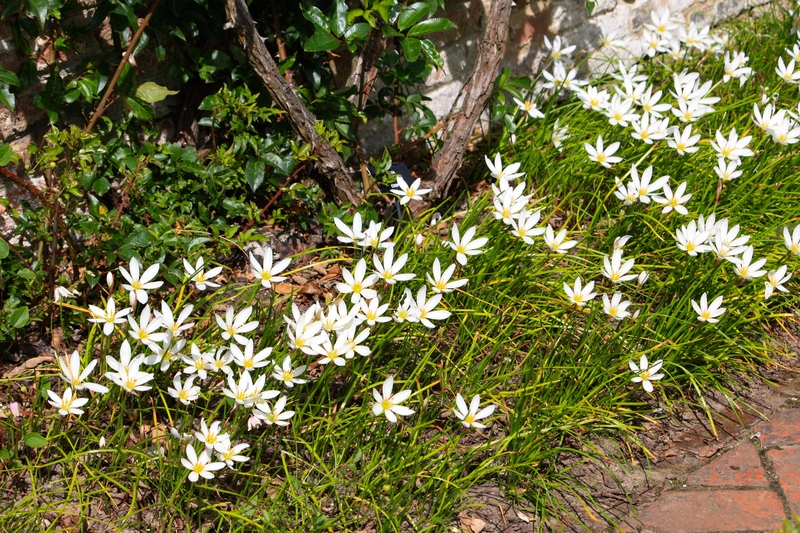 At the foot of a wall, basking in the warm sun, was a carpet of sparkling flowers belonging to the white rain lily, Zephyranthes candida. 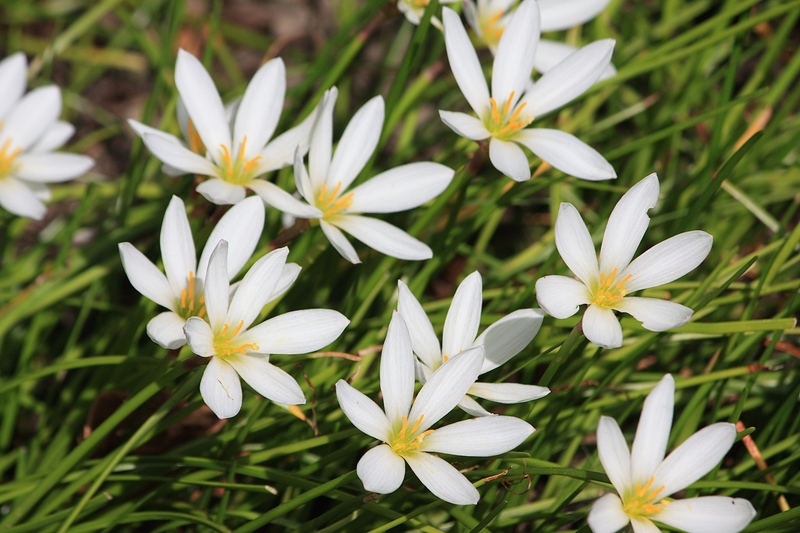 Rain lilies are bulbous perennials native to the Rio de la Plata region of South America. In the wild they burst into bloom following heavy periods of rain, hence the common name. After the soggy August we’ve had, these little stars were right on cue. 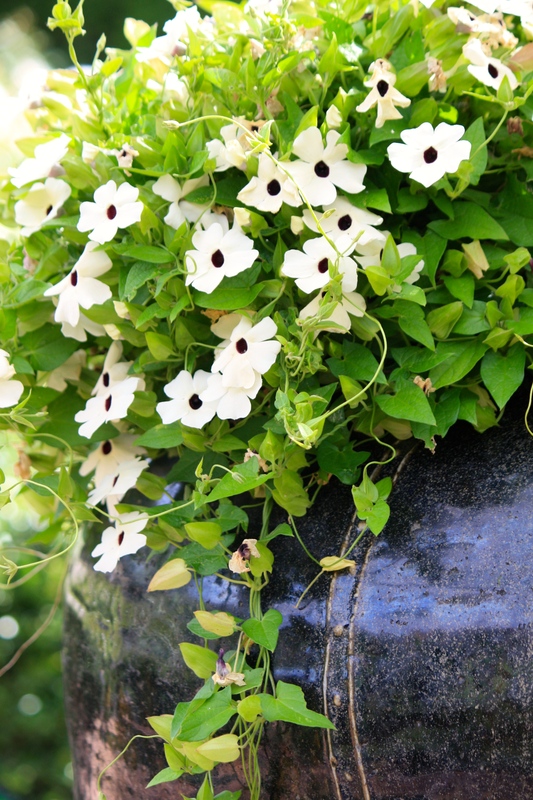 My first experience of the white form of black-eyed Susan, Thunbergia alata, was at Sissinghurst, where every year it pours gently from the lip of a glazed ceramic urn. The thunbergia’s flowers are a deliciously soft curd-white, centred around a bitter chocolate ‘eye’. It’s a lovely contrast and one of this garden’s typically well composed ‘moments’. All this cool whiteness is juxtaposed in the The Cottage Garden, where fiery heat reigns supreme. 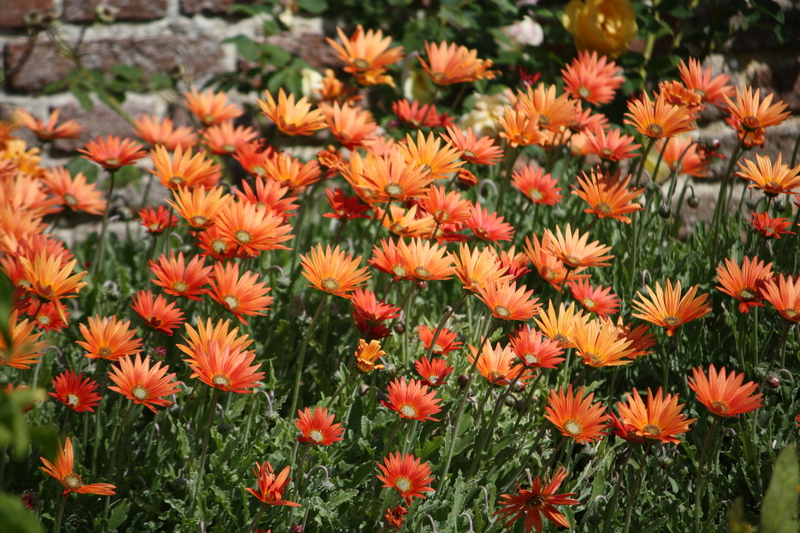 As enduring as the thunbergia are the blooms of Arctotis x hybrida ‘Mahogany’ and ‘Flame’ skirting Harold Nicholson’s hideaway. Harold bought one plant of each at an RHS show in 1959 and they were propagated until his gardeners were able to plant bold sweeps either side of the front door. Helen, one of Sissinghurst’s gardeners, had recommended to me the Dahlia ‘David Howard’, so I was keen to seek it out. Making a big splash in the middle of a border was this sturdy hybrid, blessed with burnt-orange flowers and dramatic, purple-bronze leaves. 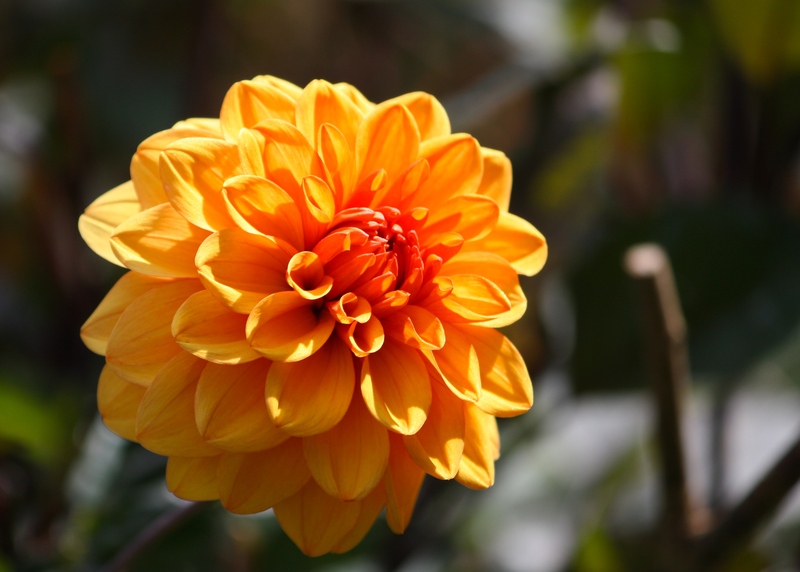 This truly is the ultimate dahlia for a ‘hot’ border or exotic planting scheme, best underplanted with shorter perennials to disguise any legginess. 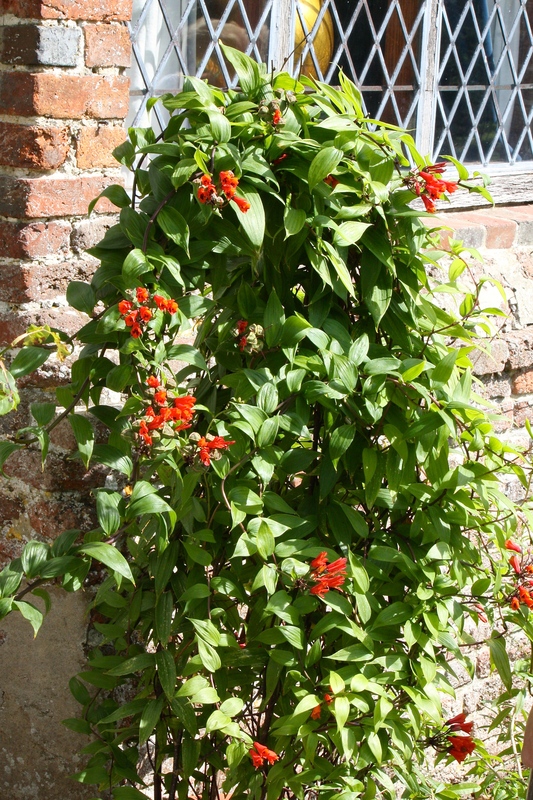 Occupying a pot next to the cottage’s rose-red brickwork was a divine specimen of Bomarea caldasii, the Peruvian lily vine. This rare twining plant can be found scrambling over other vegetation in its native South America, producing pendulous clusters of orangey red, waxy, bell-shaped flowers. This plant had especially vividly coloured flowers and was clearly in its element. A joy to see such a splendid plant grown so well. 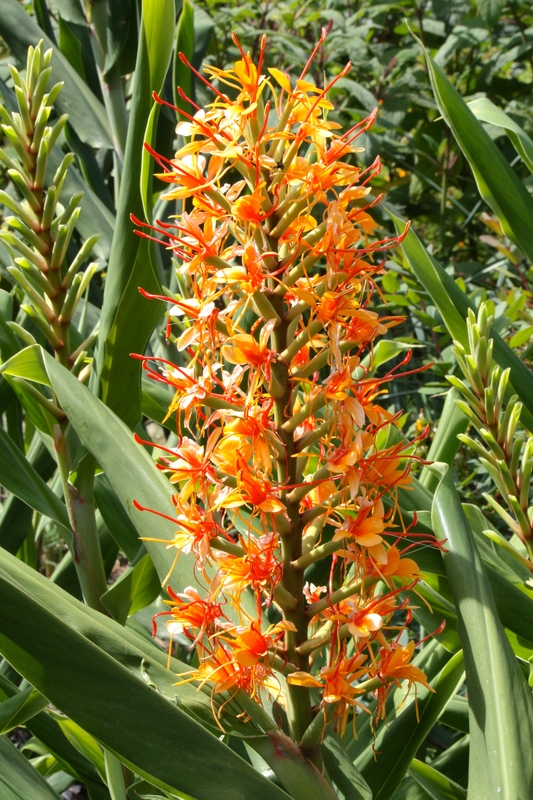 I was equally pleased to see my favourite ginger, Hedychium ‘Tara’, ablaze with tangerine flowers. I recently acquired three healthy plants from Great Dixter, which I am growing on in pots ready for planting out next year. I can already smell the sweet spicy scent of the spidery flowers wafting across the terrace at night. Sissinghurst never disappoints, offering gardeners inspiration at any time of the year. I came away full of ideas to keep our gardens’ engines running, whether it be with carpets of colchicums, cool waves of Aster divaricatus or classic Anemone japonica. Whether you’re blowing hot or feeling autumn’s chill, I hope something in today’s post fuels your fire.